First, an organ, a dark sacred warbling juxtaposed with an ominously modern buzzing. In the dark, a dazzling down-light illuminates a lone knight in shining armour refracting blues, flashing silver. The world brightens to grey, the colour sucked out. 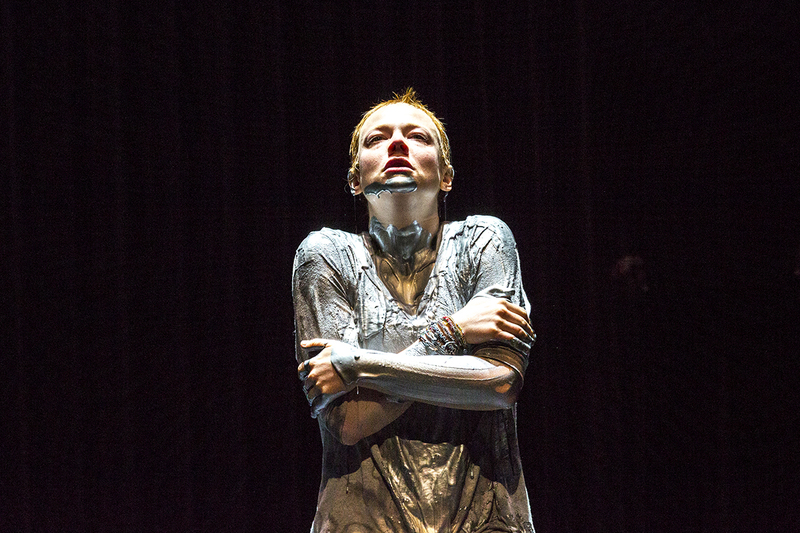 Her armour removed, a young woman, Joan of Arc (Sarah Snook), sits silent, expressionless in an abstracted evocation of the ground level interior of an intimidatingly huge mediaeval castle tower, its high semi-circling wall comprising long, seemingly soft, narrow strips of grey cloth, the hard floor lightened with the sheen of polished concrete, each aspect of this place a coherent melding of architectural past and present, hauntingly illuminated from a narrow palette of muted greys, blues and greens. Likewise, the costuming of Joan’s male interrogators, all in black, evokes chic Edwardian elegance while appearing fashionably current, including French knight Bluebeard’s stylish folds, otherwise not out of place in a Velasquez painting. Joan’s attire however is markedly modern, soft, grey and white, as if exercise-ready. She’s at first glance a 21st century woman. She is anything but. 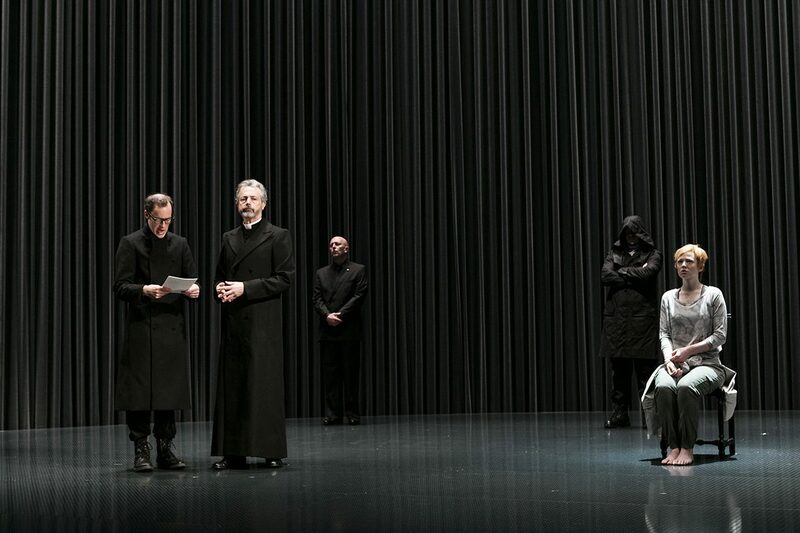 In director-writer Imara Savage’s shuffling of scenes from George Bernard Shaw’s St Joan (1923), she opens with his fourth, staged effectively as the first of a series of arraignment and trial scenes which provide the production’s core. Here Joan sits in silence while the English and French authorities engage in testy debate, with clever sparring between Bill Zappa as a sharp Jesuitical Bishop of the Holy Roman Empire and David Whitney as the blunt Earl of Warwick. The production’s other scenes are realised as interpolated flashbacks: edited key moments from Shaw and new scenes by Savage and playwright Emme Hoy in which Joan communicates with her voices — St Margaret, St Catherine and the Archangel Michael. The English want Joan dead, the French clergy for her to repent and be saved. But they do find common ground for their prosecution — each has much to lose. Joan’s vision challenges the authority of the Holy Roman Empire with both heresy and nationalism, while for the British (nationalism they like) it eliminates the feudal aristocracy from the chain of command between God and King, on the one hand, and, on the other, Joan and the people. We sense already that Joan’s fate is sealed, with even the seeding of the final rationale for her execution — heresy. The positioning of the scene is a clever move by Savage, establishing a thematic framework and underlining Joan’s inevitable helplessness. The same group of men will appear in the end in a semi-circle around her, delivering to us as much as to Joan their pulsing litany of reckoning. When it comes to the fraught mediaeval notion of the divine right of kings Joan is an absolutist; not for her the subtleties of power, hierarchy and religious law. These she can ignore with tunnel vision purpose that first wins the day — her successful lifting of the seige of Orléans and enabling the coronation of the Dauphin — but then loses the war with her failed siege of Paris and subsequent capture. In her unwavering support of the monarchy — absolute, masculine — Joan is no feminist (and in France a hero of the left and right), but nonetheless Shaw, an ardent feminist, and moreso Savage and Hoy see Joan’s life as the tragedy of a lone, powerful idealist destroyed by male pragmatists. 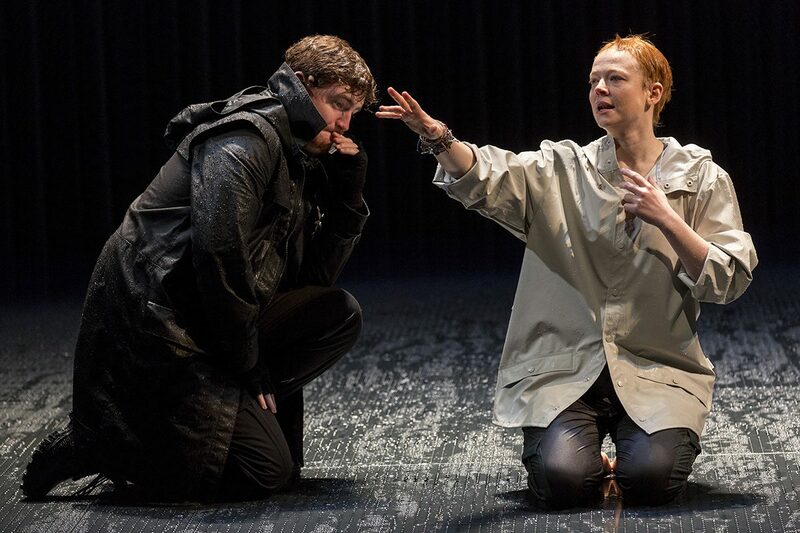 Joan’s sudden shifts of mood and temper, from flailing depression to spirited anger, are realised by Sarah Snook with wrenching acuity and lucidity, revealing the complexities of Joan’s embrace of her fate — to die in fire, despite her voices having told her she would not, but maintaining her faith with fervour. The sense of tragedy is given even greater weight by Joan’s hubris; though ever denying vanity, she brooks no contradiction, however well-reasoned, for herself, her voices and her unwise military strategy. Savage’s ambition is to transform Shaw’s St Joan into a full-blown tragedy in the great tradition. She senses one in Shaw, but his subject is often more argued about than seen and we sense little of Joan’s voices. Savage has felt compelled to grant herself and co-writer Emme Hoy licence to shear away great swathes of Shaw and run with the poet in Joan, drawing on a variety of historical and other sources. In these eerie moments, the dark closing in with an intense blue around an awed Joan, Max Lyandvert’s score elevates the sense of mystery, sadly beautiful with melodic harp and strings in a moment in which Joan expresses her great fear of pain, contrasting with the recurrent slow, grim bell-tolling that frames the interrogation scenes (ironically she tells her General —Brandon McClelland — that it’s in the sound of bells that she hears her voices). Snook’s possessed Joan speaks in her own voice as both herself and her saints. With a cruel litany-like insistence, the voices demand she recall returning to her empty family home to find the footprints of enemy soldiers who might have even touched her bed. The sense of personal invasion is palpable. The enigmatic question the voices repeatedly pose, “Are you an empty house, or a burning house?” commences here and is iterated to the very end of the play. Elsewhere Joan argues anxiously with the voices, desperately doubting her capacity to lead, to fight, to succeed. If Shaw deftly created a Joan who seems to be part divine fool — a logic-bending scourge of political and religious convention — and part plain-speaking, enthusiastic youngster, Savage and Hoy allow Snook to bracingly embody her possession, cross-legged, rocking, eyes closed, hands clapped to ears, or engaging wide-eyed with her saints, her voice lyrically transcendent. She is more complex, more believable if stranger than Shaw’s Joan and undeniably tragic. Snook and fellow performers comprise a taut ensemble, the characters’ antagonisms contained for the most part by a quasi-formal courtliness in diction and movement. Any exception stands out — Joan in every respect, Gareth Davies’ pragmatic Dauphin with his run-on whingeing and slumped posture, and the English Priest’s (Sean O’Shea) rabid testing of decorum in debate and effective prosecution with his 56 ridiculous claims against Joan, reduced by John Gaden’s coolly practical Inquisitor to 12. There are frequent pointedly humorous moments like the Priest’s claim, “No Englishman is ever fairly beaten” and his irritation that Joan’s voices don’t speak in English. As often with adaptations, the cut and pasting of original and additional material can at times lose a production its sense of cohesion. Those unfamiliar with Shaw’s play with its epic expositions and relatively straightforward narrative might be hard-pressed to clearly grasp Joan’s story in this version. Among other things, her defeat at Paris is glossed over and the merging of the General Dunois and Joan’s soldier ally (Jack in Shaw’s play) into one character results in his inexplicably abrupt turning against her. And I didn’t know what to make of Snook’s Joan seated clutching her side in the last trial scene, as if perhaps wounded. If performed in full, Shaw’s play can run to three hours; this version comes in at 110 minutes and could benefit from a little more detail from the original including what precisely enthralled her followers. At moments the production has a rather peremptory feel, for example when Joan shortens her hair, and even in the staging of the production’s final image, which — going into metaphorical overdrive — abruptly if strikingly declares that Joan’s fate is solely in her own hands. Despite these hesitations, overall the rhythm of the production’s alternation of three timelines — arraignment and trial; earlier events; Joan’s encounters with her voices — is deeply engaging and rich with further potential. In the abstract this is fine, but as Savage asks earlier, “How is Joan a hero if we take both her religious fundamentalism and her nationalism seriously?” Which we have to. The advantage of the Savage-Hoy-Snook Joan is that she embodies more otherness than Shaw’s and is not simply reducible to 21st century individualism or idealised feminism. She is stranger than that, and better for it.